Here's a full-page colour (!) 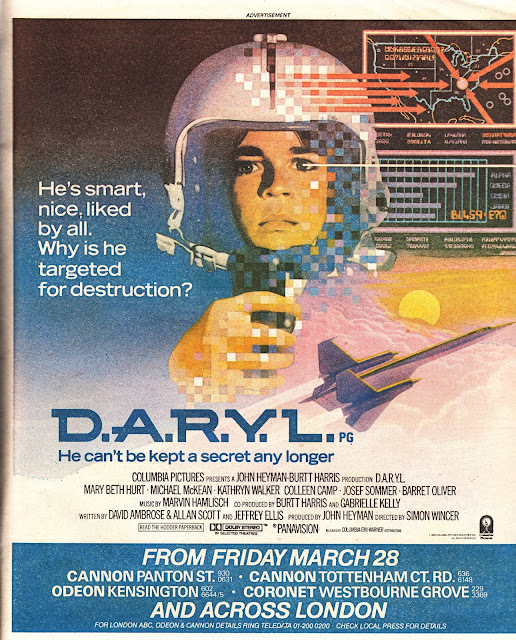 print ad for the 1986 movie D.A.R.Y.L, published in the EAGLE cover-dated 29 March 1986. I didn't see this film then (which - judging from the poster - is a mix of wish fulfilment, computer game graphics with a real-world implication, high tech hardware and a kid that's more than he seems. No doubt the nefarious US government are involved somewhere too) and I've not seen it since either. The studio's marketing department obviously had enough faith (or cut a good deal) to book in a colour spot. Money well spent?